Man’s best friend has been responsible for a lot of wonderful human advancements throughout the ages. Thanks to the domestication of dogs, humans gained the ability to herd other domesticated animals and support ever larger populations. Dogs have been guards, babysitters, watchmen, hunters, and rescue personnel among numerous other nifty vocations. 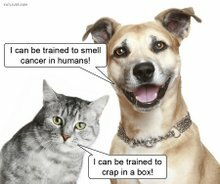 But in their ongoing effort to outdo themselves in pursuit of our affections, now dogs can smell cancer. And yes, the cats are furiously accusing them of being over achievers. So jealous. Dogs detect cancer by smelling the waste products of tumors. Usually, something as simple as a breath sample, taken from patients and stored in tubes, can be presented to one of these lifesaving scent connoisseurs, and from that single exhalation they can sniff out serious health conditions. In the case of dogs detecting cancer, they sniff out tiny particles called alkanes as well as some unknown aromatic compounds that are generated as waste byproducts in tumor cell production. The researchers working on these findings managed to train the dogs to examine a large amount of these scent samples. They were trained to ignore the ones from patients lacking cancerous cells in their system, but they would sit or lay down in front of the samples that smelled a little more deadly. For their efforts they were rewarded with tasty food treats and clicker noises. The amount of cancers dogs can detect isn’t l imited either. Through use of stool samples dogs can sense bowel and bladder cancer as well as lung from the breath smells. For once the canine tendency to sniff butts might come in handy. 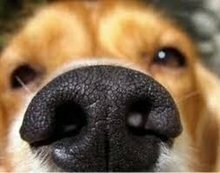 Incredibly, dogs have a sense of smell that is on average 10,000 to 100,000 times more powerful than the human olfactory sense. This stupendously sharp schnozzle is effective, (according to various estimates) anywhere between 93 and 99 percent of the time. This has led to a lot of differing opinions on practical application of dogs as healthcare professionals. Dogs are already in widespread use as ambassadors of goodwill in elderly homes and terminally ill wards in hospitals all over. Thus many medical researchers are suggesting that thoroughly trained tumor tracing hounds be on hand for diagnostic purposes as well. That would mean a hospital dog could be as common as a drug or bomb detecting canine. On the other side of the spectrum, many suggest that cancer detecting dogs should be used in labs to determine which compounds are actually being found as x factors in the detection process. That way the researchers can develop advanced detection equipment and let the dogs get back to rolling in the mud. Where ever they end up, you can bet that they’ll show up with tongues lolling and tails wagging at the prospect of being helpful to their human counterparts. Man’s best friend is always going the extra mile to try and help out an owner in need, but this latest battery of good deeds might just end up saving lives. Keep checking back for more informative pet news from the friendly folks at Petbucket.com!